During Chicago Public Schools' spring break, Cabrini Connections offers field trips to volunteers' workplaces. Our vision is that every child who joins a tutor/mentor program in 7th or 8th grade is starting a job and career of his or her choice by age 25. But for a dream to build in the mind of a student, it helps to visualize your goals. Where do you see yourself in 5, 10, 20 years? Let's go there now! Career Week kicked off today with a visit to Water Tower Place on North Michigan Avenue. Wednesday night mentor Anne Davies is an attorney and leasing specialist who works for General Growth Properties, the company that manages Water Tower Place. She introduced us to the property managers who gave us a behind-the-scenes tour! Aside from the mall itself, we saw a lot of things that you may not have known were a part of the building, such as a theatre, The Ritz-Carlton, and a secret basketball court! Thanks again, Caryn, Katie, and Brian for this one-of-a-kind access. Our students' shopping experiences at Water Tower Place will never be the same! Our second stop was DePaul University in the Loop. 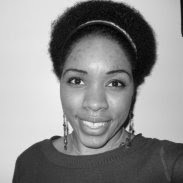 Wednesday night mentor Brea Adams is a graduate student in school counseling, but she also works for the university in the Office for Teaching, Learning, and Assessment. She helps run the Supplemental Instruction program which "aims to help students in historically difficult classes master content while they develop and integrate learning and study strategies." Brea showed us parts of the downtown campus including the student center, the College of Law, and the College of Computing and Digital Media. She also showed us the very desk she works at every week! Being just a few years out of college, Brea was able to provide great insight into postgraduate studies and career choices. 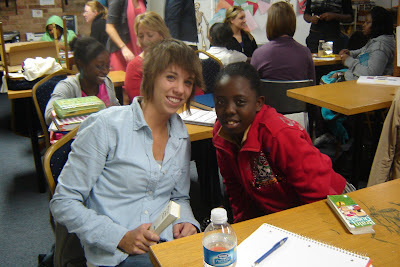 This trip was especially fun for Brea's mentee, Crystal Townsend, who was in attendance, but much fun was had by all. Thank you, Brea, for the opportunity. For continuing Career Week coverage, check out Cabriniblog for Tuesday's recap and Nicole's blog for Wednesday's recap. On Thursday, EL Da' Sheon and I will lead a trip to Loyola and Northwestern Universities. (Go U! NU!). Thanks for reading! 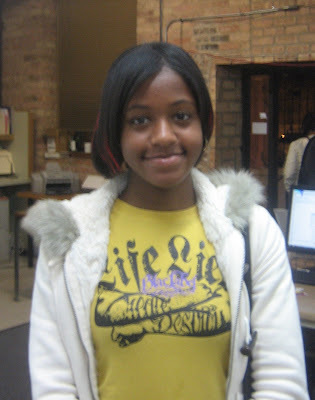 14-year-old Olivia Williams is from the Cabrini Green neighborhood of Chicago. She attends Jenner Elementary Academy of the Arts and her favorite subject is math because it’s easy. She likes art class, too, because it gives her a chance to be creative. She likes to draw things such as cartoons or designs of her own name. She struggles with science but plans to get better by paying attention in class and taking notes. Also working in her favor, she is intrigued by their next hands-on project: frog dissection! In a few years, it will be time for high school, and Olivia has her sights set on Lincoln Park. She’s unsure about college, but, in the long run, she thinks she wants to be a teacher. What inspires her to take up the call? She’s had a lot of bad teachers. She wishes they were more fun and playful and that is how she hopes to be. With her constant smile and quiet laugh, she’s well on her way. Olivia heard about Cabrini Connections through her older sister, Dominique Dobbs, who graduated in 2009. Though last year was her first in the program, Olivia made a lasting impact; most notably, by submitting the 2009-2010 theme: “Hope, Build, Believe, & Achieve.” She also qualified for our annual Six Flags trip last summer and had a lot of fun. This year, she has already taken advantage of a field trip to the School of the Art Institute of Chicago. In fact, her tip for students is to “take advantages of activities offered here.” We go on at least one field trip a month, so be on the lookout! Olivia meets with her mentor, Susan Garver, on Wednesday nights and they usually work on math and social studies. Olivia says she is “pretty awesome,” “intelligent,” and “fun to be with.” Sounds like a good match! We are happy to hear that things are going well. Congratulations on being in the spotlight! Wednesday night volunteer Susan Garver is from Grand Rapids, Michigan, the second biggest city in Michigan behind Detroit. She describes her hometown as “outdoorsy” with a lot of bike and running options (and, in the winter, skiing). It is only 30 miles from Lake Michigan. Chicago, however, is on Lake Michigan. Susan moved to Chicago five years ago after graduating from law school. For her undergraduate degree, she went to Michigan State University in East Lansing. When deciding on a college, she chose MSU because a lot of her friends were going there and it is only an hour away from Grand Rapids. “I was also excited about the prospect of a big school,” she says. There were 1000 people in her high school and everyone knew each other. MSU has over 45,000 students, making it one of the largest universities in the country. For Susan, the best part about college was the beautiful campus. “People go outside… there’s lots of green space… [and] everybody is really outgoing and friendly.” She was also lucky enough to have a very competitive men’s basketball team. The Spartans won the national championship during her sophomore year. They have been to five Final Fours since 1999 and are still alive in the 2010 tournament. Not bad! Susan originally wanted to be a broadcast journalist, but over time she realized that she wanted to do something that had more stable earning capacity. “I wanted to be self-sufficient,” she says simply. 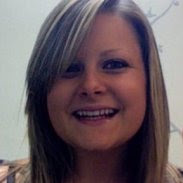 She began tracking toward law school and enrolled in Wayne State University right out of MSU. Law school was a lot more intense than college. You only have final exams (no homework, no quizzes, no midterms) and teachers call on you at random in class using the Socratic method. Five years ago, Susan became a lawyer by passing the bar examination in Illinois. She worked in traffic court for one year and has worked in workers’ compensation defense for the past four. A typical day for her starts at 9 a.m. in court. Most cases don’t go to trial, so she will work out a plan for the case with the judge and others. Later in the day, back at her office, she communicates regarding her cases and even has to investigate them sometimes, making her part lawyer, part detective! We see, Susan! Thanks for your commitment to the program! 2010 has been a busy year for interns at Cabrini Connections, Tutor/Mentor Connection. I would like to briefly introduce you to some of them and the work that they've been doing. Jordan Merlo, E Wilson, and Emily Gunn are interns from Loyola University Chicago. 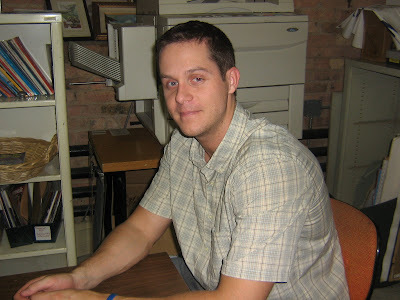 Jordan writes articles about the work we do and promotes our program via the Internet. Her goal is to learn how to be a force for social change using the communications tools of social media. E blogs about our work, too. Her goal during the course of this internship is "to be a part of the larger network working to increase the amount of knowledge on tutor mentor programming in the Chicago area and helping to share this information with people who care." Emily's goal is "to re-build the network of Cabrini Connections students and volunteers from past years, support them with current jobs and college networking and support, and learn from them the impact CC has had in their lives." She created an alumni Ning Network to facilitate this process. Li Li, a graduate student from the University of Michigan, created a flash animation based on a blog article about volunteer involvement in a tutor/mentor program. She did it in just one week as part of an Alternative Spring Break program. You can follow her project from start to finish here. All of these interns show how students from around the world can create projects in an effort to educate volunteers, donors, and public leaders about the benefits of tutor/mentor programs. If you'd like to get students from your college or high school involved, just introduce yourself on the Tutor/Mentor Connection Ning Network or contact me directly. Thanks for reading! Jon-nita Blake is a sophomore at Lincoln Park High School who boasts a 3.5 GPA. Her key to success is studying… a lot. She studies after school, takes a break, and then studies into the night. Her favorite subjects are American Literature and U.S. History, and for geometry, her most challenging subject, she has a tutor at school. Another factor in her success is her mom, Almetha. “She pushes me to do my best,” says Jon-nita. “She encourages me… She’s always there.” Hard work plus a great mom is a good combination! In her junior year at LPHS, Jon-nita hopes to run track and attend nursing class. She will have to pass a test in May to be accepted. Participants go to different hospitals throughout the year and spend their last semester in practice at Northwestern University earning $35/hour. This class lines up well with her career aspirations to be a mortician, a pediatrician, or a nurse. Jon-nita became interested in mortuary science as a young girl when her mom would take her to funerals. She remembers, at 10 years old, going to her aunt’s funeral and being fascinated by the body and the service. Her interest in pediatrics comes from being a kid and recognizing fear and distrust of doctors. She remembers her brother being very scared to go to the doctor for a routine checkup. “A lot of pediatricians aren’t nice,” she says. “They make kids scared.” Jon-nita believes her positive attitude would be a welcome force in the field. Jon-nita heard about Cabrini Connections from fellow Thursday night mentees Ashaunti Roby and Melissa Young. This is her third year in the program and her mentor is Brandy Kimminau. “I’m real comfortable around her,” says Jon-nita. “For any advice, I can call her. She’ll stop whatever’s going on… She’s like a friend.” They have meet off-site several times – girls’ night out, bike riding, bingo with senior citizens – and they always have fun. Jon-nita’s tips for mentors are to “be open” and “don’t be so worked up about work.” It can be impossible to finish everything in two hours, but, by simply getting to know each other, you can grow your relationship into something more. This summer, Jon-nita looks forward to swimming a lot and finding a summer job. In her spare time, she likes to dance and hang out with friends, so she’ll be doing plenty of that, too. All of her escapades will surely get documented in her journal. She writes, on average, three pages a day about how things are going. “It calms me down,” she says. 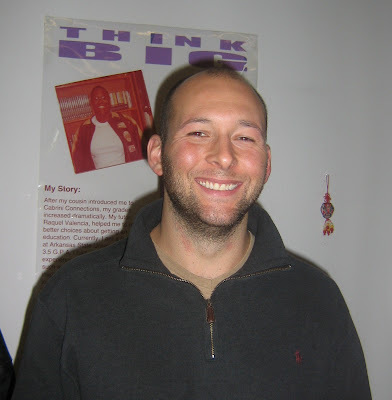 Thanks for being a calming influence at Cabrini Connections, Jon-nita. We are eager to see your progression over the next few years. Second year mentor Szu-Han Ho grew up in Lubbock, Texas, “a tumble-weed, dust bowl town” in the northwestern part of the state that is home to Texas Tech University. She went to a stellar high school with great teachers and great peers. “I had a lot of amazing people in my education,” she says. Her key to success in high school was to “find a way to love to learn;” and she said that applies throughout life; it can’t stop at school. For college, Szu-Han moved to California to attend University of California, Berkeley. While she had felt like a minority in her hometown, college was incredibly diverse. She says the most challenging part of being at a large public school is “managing your time” and “driving your own success.” With 25,000 students enrolled, it’s easy to get lost in the shuffle. She studied architecture because “it combined hands-on work... with thinking about urban problems.” She remembers, as a child, saying, “When I grow up, I want to be an architect or a teacher,” and she did it! For a few years after graduation, she worked on small projects like houses with firms of just a few people. But, soon, she had a realization: “I had spent a large part of life in school; in an office environment.” Her family owned land back in Lubbock with dreams of starting an organic firm, so Szu-Han moved home to get it started, and, in three years, she went from not knowing anything to knowing everything! She knows how to fix motors, maintain plants, and all the other life lessons of a farm. Now Szu-Han is a student at the School of the Art Institute of Chicago. She is in the Film, Video, and New Media department, but, like we learned at our recent visit, you don’t really have a major at SAIC. You can take whatever classes you want – painting, photo, video, you name it. She works on her own projects, on collaborative projects, and takes coursework downtown at the school. At Cabrini Connections, Szu-Han works with Lincoln Park High School 9th grader Charles Hill. “It’s been great,” she says. “Charles is fantastic.” They spend time on schoolwork, but also talk about other things. Last year’s big challenge was the transition to high school, which Charles survived quite well. Szu-Han’s tips for mentors are “try to find common ground” and “don’t jump to conclusions.” Teenagers live a complicated life. Don’t rush to judgment. Szu-Han’s goals are to “continue making art work” and “find something to pay the bills.” She wants to stay in Chicago, which, contrary to the dreams of recent students in the spotlight, she likes more than California. She likes Chicago because of the seasons and she dislikes California because “it feels like everybody wants to be there.” It’s a very competitive environment. We’re glad you like Chicago, Szu-Han! We’re lucky to have you. Last week's video (below) is a play on this NBA Cares commercial. NBA players give back to their communities and so do Cabrini Madness players. Watch this short commercial highlighting "The Awesomes" fundraiser at Green Heart Shop. They brought in over $600! Crystal Townsend is in 9th grade at Wells High School. She likes school because, even though she’s a freshman, “I know everybody.” Her favorite subjects are math and science because “they seem easy to me.” She struggles in English, but plans to get better by listening more, and she looks forward to learning her first foreign language next year: Spanish. At Wells, Crystal is on the dance team and the cheerleading squad. She loves to dance, sing, and draw. She is also in the Junior Reserve Officers' Training Corps (JROTC) to prepare for college and, potentially, military service. Crystal is part of the color guard, which carries flags, and she will march in the Memorial Day Parade in downtown Chicago on May 29th. If she completes JROTC, the program will pay for part of Crystal’s college tuition. She is undecided on an undergraduate school, but she does know that she wants to go to law school. She is in a Law Program at Wells in which they do mock trials. She wants to become a prosecutor. “It will help me be more outspoken,” she says, “because I am very shy and quiet.” You can do it, Crystal! At Cabrini Connections, Crystal works with Brea Adams on Wednesday nights. Though it is their first year together, she likes Brea a lot and they always have fun together. In fact, they recently went to a Bulls game! Crystal found out about Cabrini Connections from a lot of people. Her two brothers – De’Sean Hale and De’Jour Stewart – are in the program, as are her god sisters, Ana and Malina Tate. In her spare time, Crystal likes to play tennis and baseball. Her favorite player is Serena Williams and her straightforward tip for both sports is: “learn how to swing.” This spring, she looks forward to a school dance, and, this summer, she hopes to “Go Bananas” at one of her favorite places in Chicago. Have fun, Crystal! Congratulations on being in the spotlight! John “Ryan” Kracaw was born in West Lafayette, Indiana, home of Purdue University. 11 years later, he moved to State College, Pennsylvania, home of Penn State University, where he would eventually earn a Bachelor of Science degree in Genetics and Developmental Biology from the Biology Department. At the time, he wanted to become a physician’s assistant, but eventually his interests would shift to business and finance. Now Ryan works for a trading firm in Chicago doing equity option trading and high frequency finance. After graduating from Penn State, he went to this firm, took an aptitude exam, and he’s been working there ever since (two years). He started off as a trader, moved into risk management – trading millions of dollars a day – and currently works on application development, which involves a lot of strategy and detail-oriented proposals. In the near future, Ryan wants to go back to school to get a master’s degree in business administration. He dreams of using his advanced degree for greater good, such as agricultural planning with companies like Cargill and Monsanto. He would also like to own his own business some day. 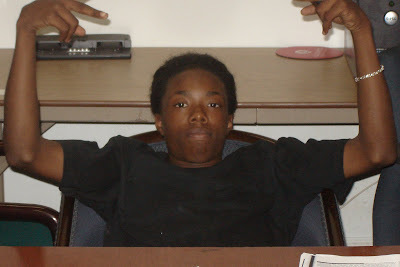 Ryan works with Von Steuben Senior Lawrence Brown, but is a substitute now that Lawrence attends night school. Ryan says, “It took a little while to get him warmed up to [tutoring]… but he listens now and he’s way more focused.” It was important to be his friend first – let him know he was there – and then he earned respect. Ryan lives in the Lincoln Park neighborhood of Chicago and plans to stay in the area for the foreseeable future. “Chicago has a very eclectic mix of people,” he says. “It has a little bit of everything.” We’re glad you like it here, Ryan! Thanks for being a part of Chicago and Cabrini Connections. 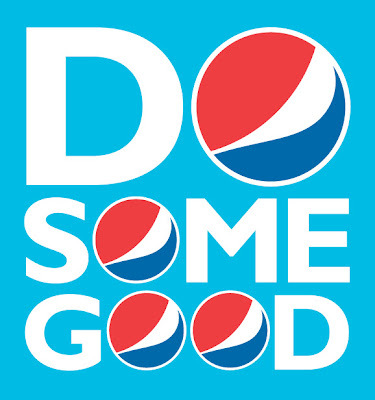 Tutor/Mentor Connection is in the running to receive $250,000 from Pepsi! This grant would support T/MC for a full year! Our goals are to expand and update the Tutor/Mentor Program Locator, expand and better promote the Tutor/Mentor Conference, expand the role of mapping in showing lack of resources in poor areas, and strategize ways to better promote and market the T/MC. We can do all of this with your help! Please vote for us by clicking the button below! Thank you! 16-year-old Shaquille Strauther is an “all-around talent.” He’s a good student, a recording artist, a studio engineer, a video editor, and a basketball player. At Lincoln Park High School, he is a sophomore and his favorite class is chemistry. Lately he has been balancing chemical equations and working with the periodic table of the elements. “I like having challenges to overcome,” he says. “It makes me want to do better.” That’s an excellent attitude to have! Shaquille’s emcee name is Pyro. His first rap came at the age of 7. He recorded his first song when he was 11. “I like to express how I’m feeling,” he says. “[Rapping] is a good way to let my anger out.” No matter what, Shaquille says, “All my music makes sense,” which is a great testament to artistic integrity. He is currently working on an album and he plans to do a lot of shows this summer. Shaquille says, “I love to perform,” but admits, “I get nervous sometimes.” Luckily he has his older brother and cousin to back him up. They perform together as a group. Music videos are also in the works for Pyro. Shaquille has been making videos since he was 13. He currently works as an editor for Hard Cover Chicago, a television program written, directed and produced solely by teenagers. “Videos make your music come to life,” he says. “It’s all about organizing the clips.” Shaquille’s interest in editing makes him a perfect match with his mentor, filmmaker and Video & Filmmakers Club Coordinator Michael Alexander. Recently they have spent time together off-site using hi-tech equipment at Michael’s office. “I got to see what he does and how he works,” says Shaquille. “I felt important.” Hopefully more students will get inside access like this during Career Week (March 29-April 2; details coming soon). Shaquille directed a video to promote an event for his Cabrini Madness team, “The Awesomes.” You can watch it here. For his AAU basketball team, Shaquille plays shooting guard. He knows how to look at the floor and fill the lanes and he’s ready to take on anyone at Cabrini Connections. If he plays basketball in college, he would love to go to Michigan State or University of Illinois, but if his focus is film and video, Columbia College may be his top choice. Regardless of where he ends up, he looks forward to getting out of Chicago. “I want to go around the world!” he says. You will, Shaquille, if you keep up the hard work. Thanks for contributing to Cabrini Connections. Alex Weiss grew up in a small farm town 100 miles south of Chicago. He learned “what it takes to earn a dollar” by working hard from an early age. He husked corn, baled hay, and worked in factories, so, after high school, when he moved to Hyde Park to attend The University of Chicago, it was a major culture shock. “I just wanted to play sports,” says Alex. (He played running back for the football team.) “I didn’t realize the value of a good education till I was immersed in an academic world.” Alex has been playing sports his whole life. He is drawn to competition and camaraderie. He says sports help with communication, encouragement, and motivation. Alex managed to take off a few years ago, and he landed back in Chicago. He worked in sales and trading at an investment bank which was a “fast-paced, loud, and exciting” job. On an average day, he got into the office at 5am to look at foreign markets and check the news. Then, 9:30am-4pm EST are trading hours for stock markets in the United States. He spent the day buying and selling stocks based on what was happening in the business environment. Now, Alex is also working on a master’s degree in business administration from The University of Chicago Booth School of Business. This summer he will intern with UBS in Stamford, Connecticut. 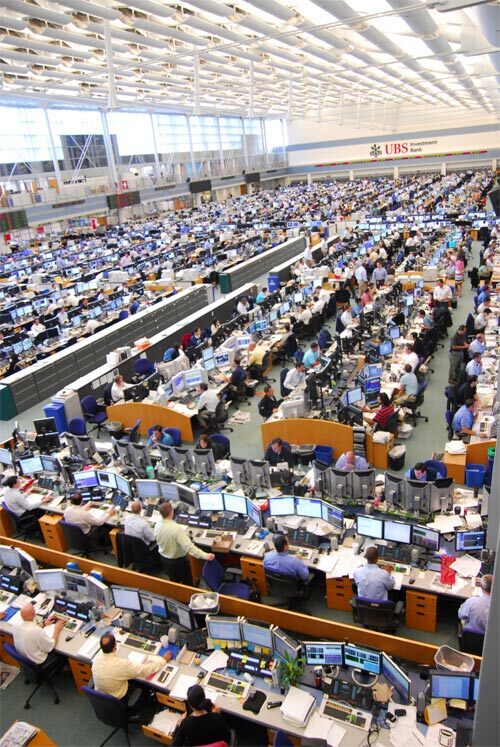 He will work on the largest trading floor in the world – it’s the size of three football fields! In the next 5-10 years, Alex hopes to get a full-time offer from a big firm, and one of his personal goals is to see more wonders of the world. He has already seen three: Machu Picchu, Chichen Itza, and the Panama Canal. Good luck with your quest, Alex! The world is yours! And now, the Top 10 Plays of Cabrini Madness for February 2010. E-mail subscribers, if you're having trouble viewing videos, please follow this direct link: http://cabrinipip.blogspot.com/2010/03/cabrini-madness-episode-3.html. 10 students, one volunteer (SAIC student Szu-Han Ho) and I visited The School of the Art Institute of Chicago today, one of the largest accredited independent schools of art and design in the country. 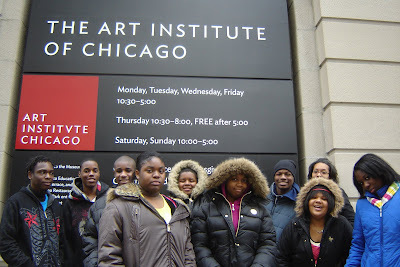 (We also visited The Art Institute of Chicago.) From our first moments in the Columbus Building, we knew this wasn't your average college. Our first three stops were a room with giant kilns, a sculpture class, and a foundry equipped to pour bronze and aluminum. We then passed through the wood and metal shop to a performance area and painting and drawing classrooms. We also saw the photography, fiber and material studies, and film, video, and new media departments. SAIC is an amazing school with incredible resources. Students have 24-hour access to studios and most of their materials can be purchased on-site at reduced cost. A lot of them don't receive grades; they have critiques - a group discussion in which you analyze, describe, and interpret art - and they simply pass or fail. Also, as part of a comprehensive liberal arts program, students take classes in humanities, mathematics, sciences, and other subjects, making them well-rounded 21st century artists. After lunch, we spent an hour in The Art Institute, one of the world's greatest fine art museums. Its collection contains more than 250,000 works of art including paintings by Claude Monet, Henri Matisse, and Vincent Van Gogh. Most of the students had never been to an art museum, so it was my pleasure to walk them through the halls of this famous building. People travel from all over the world to see The Art Institute; all we had to do was take the CTA blue line. I hope you see this unique experience as an example of the value of tutor/mentor programs like Cabrini Connections. Our learning and enrichment activities are designed to build social, team-building and leadership skills and encourage an interest in arts, technology and social service. This trip was relatively simple to plan and carry out and it cost less than $100 ($45 for CTA passes and $50 for lunch at Subway), but I guarantee their memories of it will last forever. It is important for young people to visualize themselves in college and today, if only for a few hours, that vision became a reality.